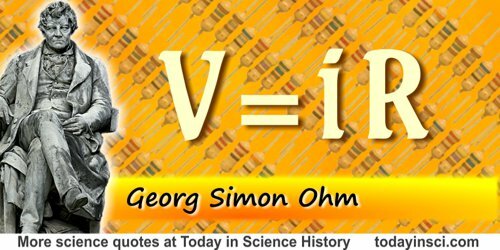 German physicist who is known for his statement of his famous Ohm’s Law: V=iR. This relates current flowing through the resistance of a conductor and the potential difference (voltage) across it, at constant temperature. The force of the current in a galvanic circuit is directly as the sum of all the tensions, and inversely as the entire reduced length of the circuit. The first expression of Ohm's Law, From Die Galvanische Kette mathematische bearbeitet (1827), 36. As translated by William Francis in The Galvanic Circuit Investigated Mathematically (1891), 50. This is now known as Ohm’s Law: V = i R, or i = V / R. From the original German, “Die Grösse des Stromes in einer galvanischen Kette ist der Summe aller Spannungen direkt, und der ganzen reduzirten Länge der Kette umgekehrt proportional.” Ohm uses S for the Strength of the current, A for total potential difference (or voltage) and L for “reduced length” which is now interpreted directly as resistance of the circuit. The translation footnotes: “‘Reduced length’ is the length of a copper wire of a given thickness, the resistance of which is equivalent to the sum of the resistance in a circuit, Ohm calls a reduced length." — Charles Wheatstone in his Bakerian Lecture (15 Jun 1843). 16 Mar - short biography, births, deaths and events on date of Ohm's birth. 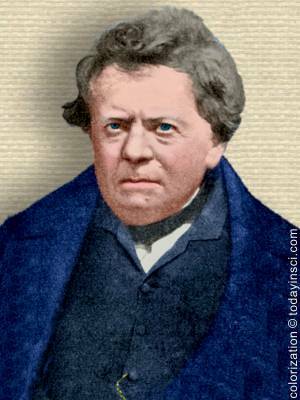 Georg Simon Ohm - Short biography from John Munro, Pioneers of Electricity; Or, Short Lives of the Great Electricians (1890). Georg Simon Ohm - In-depth biography from Rollo Appleyard, Pioneers of Electrical Communication (1930).